There comes a time in everyone's life when their current employment makes them feel as if he/she wants to stay in bed that day and/or fantasize about plotting the demise of the person at work who makes their life miserable. This July Warner Bros and New Line Cinema film allows you to live out your fantasies with the new comedy, Horrible Bosses, staring Jason Bateman (Extract), Jason Sudeikis (Hall Pass), Charlie Day (Going The Distance), Jennifer Aniston (Just Go With It), Kevin Spacey (Superman Returns), Jamie Foxx (Due Date), and Colin Farrell (Fright Night). Whether you are a cubicle drone or a blue-collar worker, this film hits pretty close to home for anyone. Nick Hendricks (Jason Bateman) is stuck working for a thankless boss that makes his job seem more like slavery than a satisfying way to earn a living -- while his best friends, Kurt Buckman (Jason Sudekis) and Dale Arbus (Charlie Day), are the victims of over-indulgent and sexually-aggressive bosses. However, one day the three decide enough is enough; and it is time to take charge of their lives and jobs by eliminating the main problem in their lives -- their bosses -- permanently! This amazing cast plays off each other at all levels possible. There is not one actor or actress who does not seem as if they were made to play the role they are given in the film. With the entire cast giving such great performances, it is hard to single out anyone as being the lead in the film. Even quick cameos such as Ioan Gruffudd (King Arthur) are executed with the perfect timing that will leave you with a pain in your side from laughter. Rounding out this perfect comedic film is director, Seth Gordon (Four Christmases)., who skillfully directs this film with such precision and timing that if he continues in the direction he is going in will be giving director, Ivan Reitman (No Strings Attached), a run for his money. Each scene in the film is of perfect, just long enough to have you smiling and awaiting the next scene to unfold in this zany adventure. When it is all said and done, Horrible Bosses will produce a discussion of the meaning of life with friends or colleagues. However, in times of stress at your daily job, you might just find yourself remembering this film and have it bring a smile to your face during a stressful day at work. Download Horrible Bosses from the iTunes Store in Digial HD. 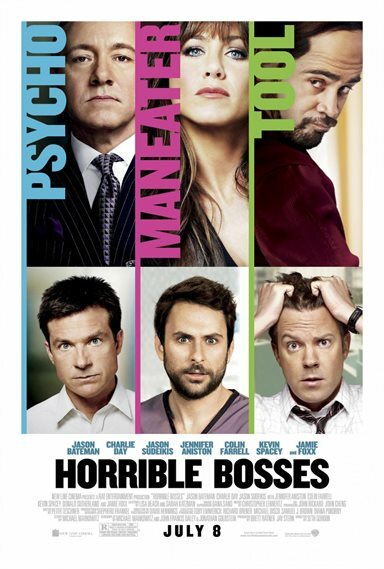 For more information about Horrible Bosses visit the FlickDirect Movie Database.